In this course we want to show you not only how to start using Goalist, but also how to think about life as a complex yet manageable system. 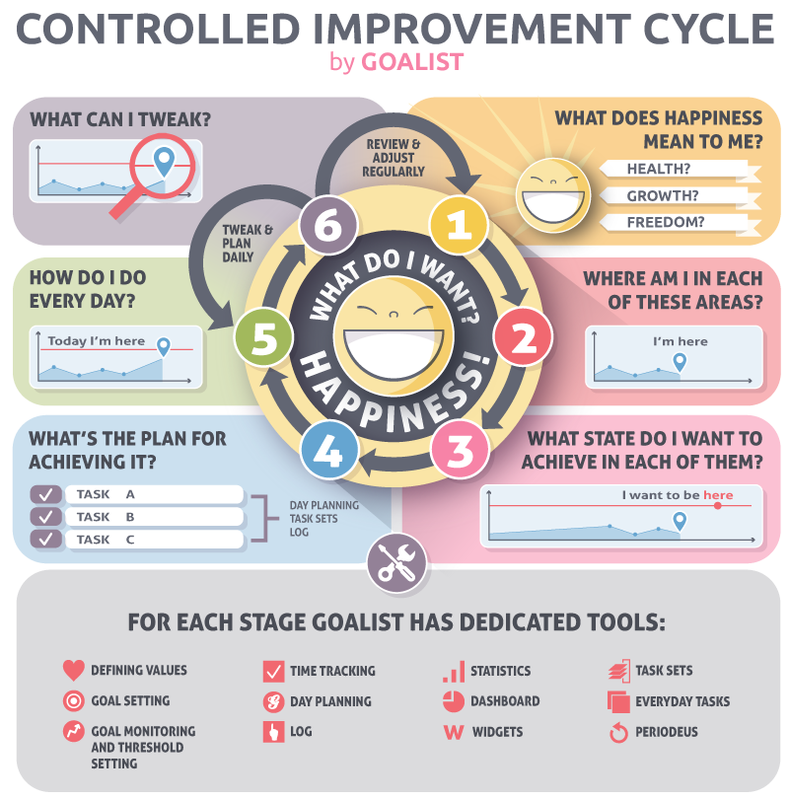 A system you can successfully tweak and control in pursue of the most important goal we all have - happiness - which ultimately stands behind all our actions. If you don’t want to live an average life you can’t leave the system to chance. And you can’t use average methods and tools. It’s normal that most things in the world are made average because the majority of everything is average. E.g. : most people are of average height. So the seats in buses are always made for average body height. And there’s usually not even a single one installed for a higher than average person. Deep inside you know you’re not average. You’re different but you may not be completely sure what it means and how to deal with it yet. This training and Goalist will help you dig deep and find the answers. "For them who need serious time management! Grateful this exists. I've been wandering around and try one by one to do list and planner app, this one is the best. No, best is not the word - this app belongs to me." "After becoming breathless and ending up in a coma I stopped doing anything. This has helped me realise I can live again and monitor how I'm doing. It's really helped me to enjoy small things in life and gradually do a little more each week. So I thank the people who did this app. Yeah I can live again." "At first I was a little slow to get used to the whole system, but it is worth investing some time to learn to use it because then you discover that Goalist is much more than a list of tasks, is a planning system based on values and objectives that allows you to track your progress. It's nice to see you progress in the right direction." "A real help for time & life management I like the features that have you establish tasks based on your life goals. It helps you decide what tasks are worth doing. Then it allows fast creation of your daily plan. It is the best app I have seen for fast changes to your schedule throughout the day." "Haven't missed a single day of planning. It's helping me account for every minute of my day. It essentially lets you look at time-use through a microscope. Which means I now waste less time scrolling thru my FB or idly watching TV. It's the most insight I've ever had on how I use my time." "Complex but that's exactly what life accountability is I've been searching, installing, testing, and comparing different planners/goal trackers/to-dos/habits. Goalist is not just a Goal tracker or habit helper, it's our life. It's our time! It's the every minute and every second in our life!"